News — Ulysses Owens Jr. The best aspect of transitioning to jazz from a classical background is my fundamental understanding of music and technique, which has given my jazz playing a distinctive approach and sound. Ulysses Owens, Jr.: “Songs of Freedom” (Somethin’ Cool). 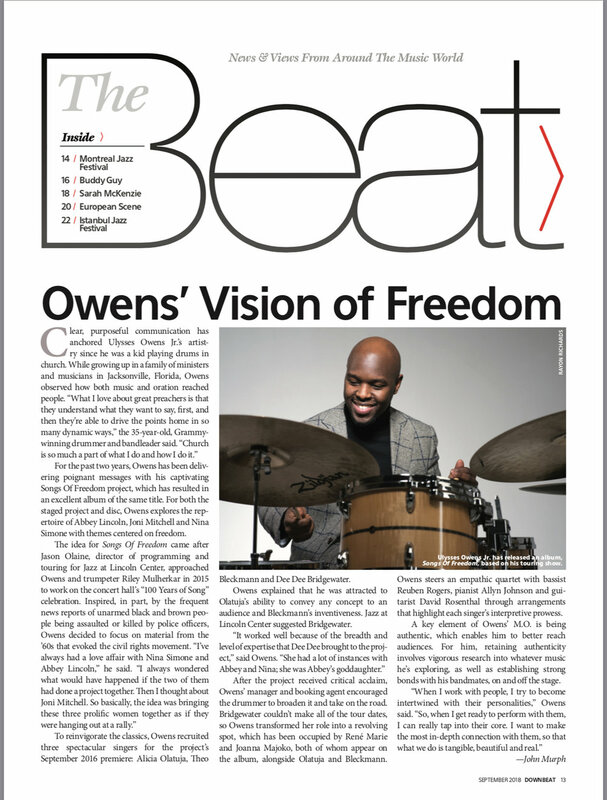 Last spring, drummer Owens brought his ambitious “Songs of Freedom” suite to the University of Chicago’s Logan Center for the Arts, the work emerging as a potent reflection on music of the 1960s – and its message of civil rights. The City of Jacksonville’s Kids Hope Alliance is offering mini grants for programs designed to fight youth violence, and organizations like Don’t Miss a Beat are benefiting from those dollars. RT @globaljazzqueen: @UlyssesOwensJr @armoryman14 @WBGO @bmarsalis @joeycalderazzo @EricRevisBass @NinaSimoneMusic Thank YOU for the inspired music. The Tri State Defender - Memphis Jazz Workshop rolls on with Ulysses Owens Jr.
Modern Drummer - Must have Gear with Ulysses Owens Jr.
It’s not every day that students get to learn from someone who has earned one of the top honors in their field, but that’s what happened Monday at Oakleaf Junior High. Falling Forward with Ulysses Owens Jr.
Jazz 90.1 with Ulysses Owens Jr.